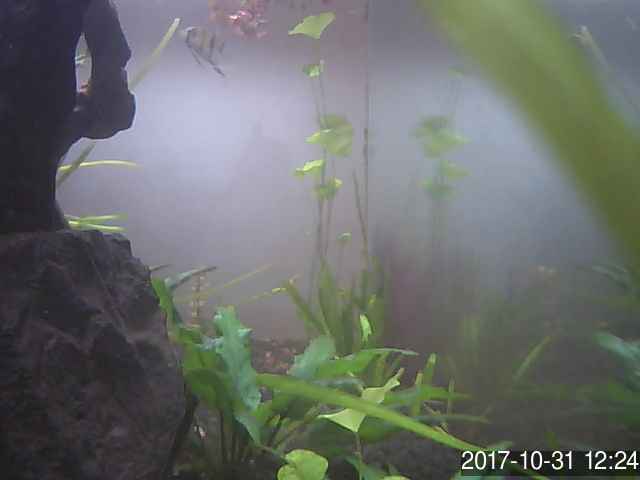 Now you can watch in near real time our tank. It all began in June 2014 when we’ve decided we needed a little more life (not so intelligent life) in our organization. Following in the footsteps of our founding institution (CIIMAR.up.pt) we have built a freshwater aquarium where we’ve put some fish (Angel fish: Pterophyllum altum), and (somewhat demanding) tropical plants. Over time our 'pets' have grown and a larger tank was required. After the set-up of the new tank with fertile soil, gravel, some species of plants and decorative wood, the Nitrogen Cycle started, which is essential for sustaining life in all aquatic environments. For several days we have made many water changes (50-70%) and measured various physical and chemical parameters (temperature, ammonia, pH and carbon dioxide) until they’ve become stable and appropriate to lodge our 'friends'. The necessary equipment to monitor periodically (every 3 hours) the main parameters was also assembled. The fish were moved to the 'new home' on the 10th of April 2015. Given the excellent water quality conditions of this new 'closed system', in a few days, the fish formed two couples that quickly defined their territory, and at the end of a week, made the first egg postures (photos attached). We are now proud ‘adoptive’ parents. If you want to 'contemplate' our live scientific aquarium, we are on the floor-0 of Madeira Tecnopolo. This project served two purposes: to give some (not so intelligent) life to CIIMAR-Madeira and also to demonstrate our ability to monitor, in real time, several different physical-chemical parameters in aquatic environments. Only through precise monitoring it is possible to maintain the parameters at acceptable levels to optimize growth as well as minimize risks (sometimes lethal) to aquatic organisms. Below we show some graphs of the monitored parameters.